Next stop was Prague, and what a treat it proved to be. As we left Vienna it was cloudy and grey and it had rained hard over-night, no matter, it was a travel day so the weather couldn’t spoil anything for us. The train journey from Vienna was very easy, to start with we travelled across bare farmland that grey brown colour you get when the ground has been covered by snow for weeks. Midway through the journey we started to climb through wooded hills and gorges, beside the track we could see pockets of snow still laying in shady corners and some of the streams feeding into the river were frozen solid. It was hard to think that not much more than a week ago we were enjoying the lush green coastal plains of Sri Lanka. We were about an hour late arriving in Prague due to some disruption on the line, rather than holding us on the line the train took a detour through some very small towns where people on the stations seemed very surprised to see an intercity train passing through. We finally arrived in Prague and headed for the taxi rank where a big, burly taxi driver said it would be 25 Euros to our hotel because it was outside the city. We hadn’t done much research on Prague but we did know where the hotel was and it wasn’t 25 Euros away. We declined his offer and headed to the tourist information desk where a kind young man said the fare should be nearer 10 Euros and booked us a taxi accordingly. It occurred to us that this was the first time in our whole trip when someone had tried to rip us of that blatantly – nice to be back in Europe!! When we reached the hotel it proved to be in a brilliant location, it was a very old building about 50m from the famous Charles Bridge in the Lesser Town, underneath the Castle and just across the river from the Old Town. When we checked in the receptionist gave us some information about tours and sights to visit in the city, we had a look at them over a cup of tea and decided to book a one day tour that included all the main sights we wanted to see, back at reception we made reservations for the second full day of our visit. Once we had settled our plans we headed down to the hotel bar/restaurant to use the ‘free drink’ vouchers we had been given by reception’ the restaurant proved to be in a lovely vaulted cellar and offered a menu of traditional Czech delicacies so we ordered dinner to go with our free beers. Next day dawned bright and sunny, can you believe our luck? After breakfast we set out to have a look around, knowing that we had a guided tour the next day meant we could just wander and drink in the atmosphere without having to keep checking where we were or what we were looking at. Prague is incredibly beautiful, the old town (actually made up of four separate old towns) was very extensive, perfectly preserved and very well maintained. Just behind the hotel was a square dominated by a church, it turned out that was where Mozart used to practice playing the organ when he was in town. Charles Bridge is pedestrianised which means you can wander across at leisure taking time to look at the baroque statues that line the bridge walls. We made it to the old town square at about 11.45, just in time to see the 600-year-old Astronomical Clock mark the hour, we found a seat outside a café opposite, ordered two glasses of mulled wine and settled back to watch the parade of saints in the windows above the clock. We explored some more during the afternoon and then headed back to the hotel. That evening we went for dinner at a restaurant I had spotted on Trip Advisor, it was run by a local brewery and offered a traditional menu. The house speciality was a 1.9kg leg of pork served with chips and sauerkraut, just the thought of that beat us so we ordered goulash (me) and pork steak (mark) both served with dumplings, very tasty. We had spotted a coffee house on the corner near the hotel so we went there for coffee and dessert, a perfect end to a lovely day. Our guided tour started at 09.30 on another perfect spring morning, we were picked up by minibus and driven to Prague Castle at the top of the hill, once there we met our English-speaking guide Katya and the rest of our tour group, there were 21 of us in all. Katya led us through the castle precinct and into the castle itself which houses one of the president’s official offices so it is heavily guarded and we had to pass through airport type security. 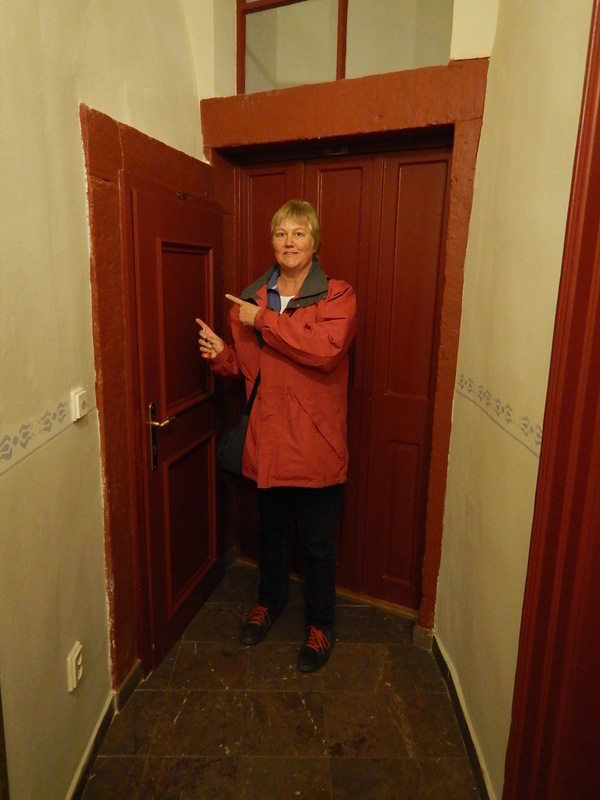 Once inside we could see the series of courtyards which make up the castle and visited St Vitus cathedral. Back outside the castle we took in a panoramic view of the city before setting off down a flight of 208 steps back to the Lesser Town below. The tour continued through cobbled streets and pretty squares finally reaching the river where we boarded a boat for a river cruise, by this time the sun had really warmed up and we sat on deck enjoying complimentary refreshments and watching Prague drift by. We followed Katya over the Charles Bridge and through the Old Town Square eventually arriving at a restaurant where we all had lunch before finally touring the Jewish Quarter (birthplace and home of Franz Kafka) and back to the clock in time to see it strike four o’clock. We made our way slowly back to the hotel stopping to sample a chimney cake on the way (we didn’t get desert with our lunch). We have really enjoyed Prague and both agreed we would like to come back for another look one day.